Citation: C N Trueman "James I"
James became king of England aged 37. At the English court, his appearance was a source of comment, though not criticism. He was tall and broad shouldered. Yet he had thin spindly legs. The formality of a banquet held by Elizabeth was somewhat undermined in the era of James by his eating habits that to some English courtiers bordered on the comical. The public figure of James masked a penetrating mind and he was very aware of the dignity of kingship and sense of duty. In later years, he was to admit that some of his public statements had made him look a fool – such as his Speech from the Throne to Parliament in 1621 – though that was never his intention. While in Scotland, James had done a great deal of reading about statecraft. He had also produced a book in 1603 titled “The True Law of Free Monarchies”. The theories in this book were not original but they did state with extreme clarity his belief that kings had absolute legal sovereignty within their state, that a king had absolute freedom from executive action and that a king’s sole responsibility was to God. The experiences James had as king of Scotland were bound to have a knock-on effect in London. James held the Scottish nobility in disdain. It had for years attempted to dilute his authority and, as important, had never taken James seriously. As a result, when James arrived in London, he was keen to cement his relationship with England’s senior nobility – so that they would be grateful to the new king for their position in English society and work for him. Men such as Robert Cecil and Thomas Sackville were brought into the court of James, while the Howard’s found that their former status in society was given a major boost with the king’s support. However, by taking the likes of Cecil and Sackville out of the Commons, James lost two astute political managers who knew how to operate in the Commons. This mistake first showed itself when James had his first session with Parliament in 1604. Here he ended up arguing with the Commons over the relatively minor topic of the Buckinghamshire Election. In what was to be a familiar approach, James adopted a very weak argument with regards to this case, but decided to stick with it rather than appear weak. At least he proved to be decisive in that once he adopted his argument he kept to it. But such an approach simply meant that at some stage he would have to give in – and so it happened with this first ‘clash’ with Parliament. Whether having the likes of Cecil and Sackville within the Commons to manage his support would have led to a different outcome is open to speculation. The 1605 Gunpowder Plot seemingly solved the Catholic issue. James had an upbringing that was fraught with danger. In 1582 as king of Scotland he had been kidnapped by Scottish nobles and only escaped in the following year. The one great fear of his life was a violent death. The Gunpowder Plot played straight into this fear. It was James who signed an order that the captured conspirators should endure the minor tortures first and then that the torturers should move onto the more extreme to extract a confession. The public execution of those conspirators who were caught was a stern reminder of what would happen to anyone else foolish enough to involve themselves with treason. However, there was no large-scale hunting down of Catholics in England – possibly because the retribution against the conspirators had been so violent – and public – that it drove them even further underground. Also the leading Jesuit in England at this time, Henry Garnet, had been critical of Spain for signing a peace treaty with England in 1604. It far better suited Catholic Spain to maintain a peace with England than continue to support Garnet in England. The attempt on the life of James – and Parliament in general – helped to build a more positive relationship between the two. James had publicly stated that if the explosion had succeeded, he would have died with the “most honourable and best company and in that most honourable and fittest place for a king to be in.” The 1606 Parliamentary session voted James three subsidies in direct taxation. But this seemingly very positive relationship lulled James into a false sense of security. With this new relationship with Parliament and their seeming wish to grant subsidies, James became more and more extravagant. The splendour of Whitehall, when compared to the royal palace at Holyrood, convinced James that he was wealthy or that he had access to money from a generous Parliament. He became a lavish spender – his coronation cost £20,591. This was mirrored by his wife, Anne of Denmark. She developed a love of fine clothes and expensive jewels. James also believed that his three children – two boys and a girl – should also live in a manner befitting princes and a princess. James also gave away lavish gifts. One courtier who had worked under Elizabeth I, Sir Dudley Carleton, claimed that James gave away more in one year than Elizabeth had done in the whole of her 45-year reign. It is generally considered that James had great difficulty with understanding the most basic of fiscal responsibility. He would happily give away £100 without any thought if it was not in his possession, but he would keep a firm grip on just £1 if it was actually in his hand. To compensate for any requirement of money, James, like Elizabeth, sold off Crown Lands. This became such a problem that in 1604 and 1609, Cecil persuaded James to pass on the more valuable Crown properties to be run by the Privy Council. To raise money James sold government offices and positions. This had been a common practice in bygone monarchies – but James took it to an extreme in his search for money. By selling office titles, he did not consider the ability and worth of the man who bought the office – merely his income and ability to pay. Therefore, in the eyes of men who had received an office in reward for their work for their country, James was seriously devaluing their work and achievement. This was to cause resentment – but it also brought into government men with money but possibly not the ability to fulfil to the full the work that the purchased office required. What caused the most resentment was when Scottish favourites gained a title. The most notorious was when Robert Carr of Ferniehurst was knighted in 1607 and then made Viscount Rochester in 1611. Carr was a coarse man who brought discredit on the English court. James’ public display of affection for Carr and others did not go down well at court. “The king’s kissing them after so lascivious a mode in public, and upon the theatre, as it were, of the world, prompted many to imagine some things done in the retiring house that exceed my expressions no less than they do my experience.” (Sir Anthony Weldon) While such behaviour caused concern at court, it does seem that the English public (even if they knew about such behaviour) was less concerned. One time consuming passion of James was hunting. James had become keen on hunting in his youth but now as King of England, it became almost an obsession. The bulk of his year was oriented around hunting. If James had a good day’s hunt, his mood in the evening was buoyant. If the day had not gone well, he would retire to his room. This made communication with his ministers very difficult as only the most favoured had access to James when he had finished a hunt. From the earliest years of his accession, James made mistakes. He tried to personalise politics by promoting to positions of authority his favourites; he believed that he, as an academic, had a correct answer to all problems; his behaviour, amusing at first and tolerated, eventually brought the royal court into disrepute; his closest friends were also greatly suspect for a conservative court and his dilution of positions of rank also caused friction. Cecil did all he could to make the Crown solvent. He particularly targeted Crown lands where he increased the rent raised by these ands by two or three times. This hit the middle nobility more than others at a time when inflation was damaging their financial standing in the community. They blamed Cecil for their plight and in 1610; Parliament was dissolved with MP’s and Cecil at loggerheads. Cecil’s solution to the king’s financial situation was the Great Contract of 1610. This would have surrendered the feudal rights of James in return for a guaranteed annual income. It did not come into being in Cecil’s lifetime – in fact, probably the only constructive solution to the king’s financial situation only came into being in 1661 such was the distance that had developed between the ministers of James and the men in the Commons. The historian Dr J P Kenyon claims that the Crown lost control of Parliament in 1610 and never regained control of it. In November 1610, James summoned some MP’s to “ask of them some questions.” The MP’s used the opportunity to freely criticise his Scottish favourites. Greatly angered by this, James prorogued Parliament – despite the protests of the loyal Cecil. In January 1611, James did the same. It was not an approach that was likely to endear him to Members of Parliament. Then between 1611 and 1612, James faced three major problems. Richard Bancroft, the man who James had used to sort out religious issues, died. 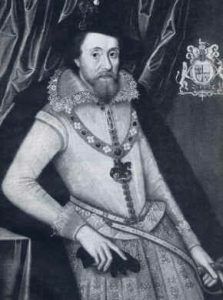 Robert Cecil, Earl of Salisbury, died in May 1612. Cecil had been a loyal servant to the Crown and had a vast amount of experience that simply could not be replaced. Cecil had not trained a successor. In November 1612, Henry, Prince of Wales, suddenly died. Henry was well respected by many. He was sober, bluff, and manly and had a physical presence that his father did not. Many were willing to tolerate James knowing that the Crown would be passed on to Henry. With his death, the Crown would pass on to Charles. He was an unknown quantity as Henry had done a great deal to outshine his younger brother in London. The death of Cecil gave James the chance to show that he was a decisive and strong king and that he did not need anyone else to support him. Unfortunately, this was not the case. James, so it was said, had many decent ideas – but was simply too lazy to carry them out. He also did all he could to stop the rise of another Cecil-type figure as such a person would have, in the mind of James, diluted the authority of the king. Probably the most able man at court was Francis Bacon. But Cecil had done all in his power to slow down the rise of Bacon as he viewed him as a rival for power. With his opinion suitably slanted away from Bacon (though he became Attorney-General in 1613), James vested power in the Howard’s. The Howard’s were a family used to being close to royalty. The family head was Henry, the Earl of Northampton. He was the brother of Thomas, Duke of Norfolk, who was executed for treason in 1572 as a result of a conspiracy with Mary, Queen of Scots. One of Henry’s closest supporters was Thomas, Earl of Suffolk – the son of Thomas, Duke of Norfolk. A grandson, Thomas, Earl of Arundel, was also a keen supporter of Henry. The influence of the Howard’s was strengthened when Frances, daughter of Thomas, Earl of Suffolk, married Robert Carr – the favourite of James. Frances was married to the Earl of Essex. James took a great interest in the annulment proceedings (the marriage ended because of the impotency of the Earl of Essex) and all but presided over the marriage arrangements. The wedding was in September 1613 and all accounts of it describe its magnificence. In November 1613, Carr became the Earl of Somerset. The marriage clearly gave the Howard’s the ear of the king’s favourite. The Howard’s were a Catholic family – or at the least sympathetic to Catholicism. They urged James to get Charles to marry the daughter of Philip III, king of Spain, with the ultimate aim being the reconciling of the English church to Rome. The idea of a marriage between his son to the daughter of Philip of Spain intrigued James. A union between Spain and England had advantages. James also saw it as a way of boosting his standing in Europe. In his mind, he had come from a minor Scottish royal family. To marry his daughter into one of the premier families of Europe would greatly lift his status in Europe. Some also believe that James had a vision of spear-heading a movement that would unite Protestants and Catholics and take the chaos out of Europe. The death of Henry IV of France in 1610, had taken from Europe the only major royal figure. James hoped to fill this void. Ironically, at the time, the competition for this role was hardly major – Rudolf II in Germany was not an awe-inspiring character; Philip III of Spain lacked any half-decent reputation and Louis XIII of France was too young to have gathered any form of good reputation. However, James was not a successful statesman. His upbringing had led to him developing a hatred of war and any foreign policy that might result in war was quickly discarded. “He naturally loved not the sight of a soldier, nor any violent man.” Though James wanted to avoid any foreign policy that might lead to conflict, he did not allow anyone else to formulate policy. He sort the advice of many but failed to act on any of this advice. This infuriated all and sundry and resulted in a muddled foreign policy. Many suspected that a potential marriage between the future king of England and the king of Spain’s daughter was the start of a move to restore Catholicism to England. In fact, they failed to recognise that James was a Protestant and had made his Protestant credentials clear. The rumours that circulated in Parliament were nebulous in the extreme. However, in 1614, the rumour of a royal marriage to Spain combined with a rumour that Catholics had interfered with elections held in that year and had, therefore, undermined Parliament. What had happened is that some local elections held in 1614 had been influenced by the Howard’s. This was certainly not unusual in that era (and beyond) but it had been interpreted by others that Catholics had been at work to undermine the system! The so-called ‘Addled Parliament’ of 1614 lasted for two months and was dissolved when no-one could satisfy anyone else that it had been fairly elected. James said “I am surprised that my ancestors should have permitted such an institution to come into existence.” The death of Henry, Earl of Northampton, in 1614 helped to pacify the situation as the Howard’s could not take advantage of the situation whereby the king was without his parliament. Robert Carr, Earl of Somerset, had been the favourite of James since his accession in 1603. In 1614, James found a new favourite – George Villiers. Villiers was twenty-two when he first met James. He was tall, handsome, muscular and very ambitious. He was from a minor noble family from Leicestershire and had spent time in France learning how to dance, duel and ride. With the decline in the influence of Somerset (after the murder of Sir Thomas Overbury), the rise of Villiers was fast. In 1616, Villiers was appointed Master of the Horse, made a Knight of the Garter and created Viscount Villiers. In 1617, he became Earl of Buckingham and in 1619, James made him a Marquess. The speed of the fall of Robert Carr, Earl of Somerset, was matched by the speedy rise of George Villiers. James referred to him as “my sweetheart”, “My sweet child and wife” and “my only sweet and dear child”. In response to this Buckingham flattered the king at every opportunity. Buckingham’s rise to authority could only be at the expense of the Howard’s. In 1618, James acquired a new finance minister, Sir Lionel Cranfield. He had risen up from poverty to become a wealthy merchant financier. Cranfield was ostentatious with his wealth, vulgar at court – but he had an excellent financial mind. From 1618 to 1621, Cranfield did something that even Robert Cecil had failed to do – reduce the royal domestic expenditure. With Buckingham, Cranfield formed a formidable duo. It was Cranfield who investigated Suffolk which led to his conviction for corruption. In 1619, Cranfield also investigated Lord Nottingham, head of the Admiralty, who was dismissed for incompetence. Buckingham was appointed Lord High Admiral while Cranfield became Master of the Wardrobe, Master of the Court of Wards and a Commissioners of the Treasury. Foreign policy under James rested almost entirely on one simple formula – could it be afforded? Hence when the Thirty Years War started in 1618, England did nothing despite the religious issue being a prominent one in Bohemia. In fact from 1618 to his death in 1625, the English input into the Thirty Years War was minimal. There are probably several other reasons for this other than an inability to finance such a venture. Bohemia and the issues surrounding the Habsburgs seemed a long way off and unlikely to affect England. Also James received little advice from Buckingham on what to do, so he set about formulating foreign policy himself. As James was loathed to involve himself in hard work, this meant that any development of foreign policy was bound to flounder. In his last few years James contented himself by playing with Buckingham’s children. He was now feeble in body – though not necessarily in mind. Realising the power that impeachment gave to the Commons, he warned his son and Buckingham that it would be a rod with which both could be beaten – Buckingham might have to face up to impeachment while Charles could see those who supported him impeached. In 1624, James even had arguments with Buckingham over war with Spain – but ‘Steenie’ always got his way. James died on March 27th, 1625, at his favourite hunting lodge – Theobalds in Essex. His funeral was described as magnificent, confused and disorderly.